The board-certified doctors at NorthWest Urgent Care of Ohio are available seven days a week if you need a medical physical right away. 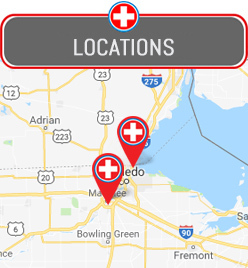 No appointment is ever required at either one of our centers, making it easy for you to visit us when it is convenient for you. Physicals can be challenging to schedule with your regular doctor without taking a day off from work. Often, the best appointment slots are filled up a month or two before the start of school or a sports season. Our extended hours and weekend availability allow you to get a physical in without choosing between missing a day of work or a day of activities. We are an excellent choice if a deadline is looming to hand in completed forms. Regardless of your age or the age of your child, a physical is often a requirement to play a sport or participate in after-school activity. These examinations ensure someone is medically fit to participate. Those responsible for managing or running an activity need to be aware of any medical conditions. You might not even be aware of a medical situation until you have this physical. Many parents have brought their children to our facility when they find out that they only have days or hours to return physical forms. Don’t panic! Bring the paperwork in today and let us take care of the rest. No one will miss practice because they couldn’t get a physical done on time. If you are a small business owner or manager, safety is a big concern. It is essential that your workers can safely perform the duties associated with their role at your business. Send any potential employee to our center for a pre-employment physical before you make any hiring decisions. We will make sure they don’t endanger your other workers. We can also administer drug and alcohol tests before you hire anyone as well. Do you have specific, industry-related concerns? Come to our center today, and we’ll work with you one on one to develop a customized physical to fit your needs. When you visit, you can set up a corporate account to facilitate future visits to our facility. Do you need a commercial driver’s license to work? Also known as a CDL, this license requires a specialized DOT Physical from a certified provider. The doctors at NorthWest Ohio Urgent Care are all approved to administer this physical to obtain your CDL medical card. We are an excellent choice if you are trying to obtain this license for the first time or if you need to renew it, which must be down every two years. Don’t let a valid license lapse and miss a day of work. Visit our walk-in urgent care clinic for a DOT Physical! Our center accepts most major insurances and we have self-pay options available. Feel free to call either one of our centers if you have any questions about our physical examination services.